Evolved over five centuries, Mexican folk dancing is seeped in the history and culture of Mexico. 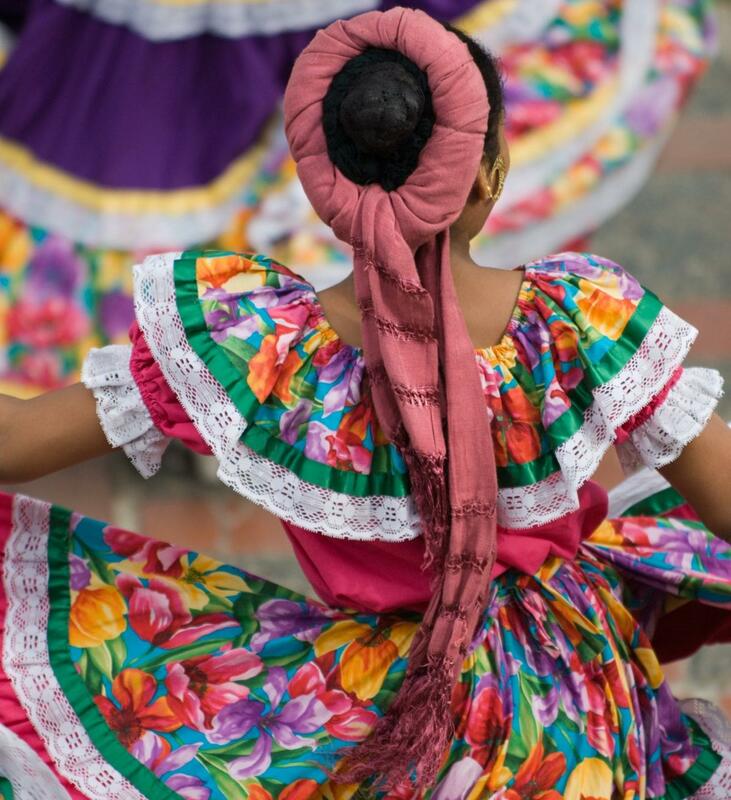 A look into these Mexican folk dancing facts, reveal the stunning vividness and cultural richness of this beautiful dance form. Performed by both men and women, the traditional form of dancing has taken many forms over the ages. However, the spirit of most of these dances remains rooted in the creative expression and the history of this amazing country. One of the most stunning and culturally rich dance expression of its kind, the Mexican folk dances are a display of the colorful heritage of the country. Each of the thirty one states in Mexico have their unique dance styles. Most of these dance styles are heavily influenced by the complex history of Mexico, which includes the Spanish Colonial Period, the Mexican War of Independence and the 1910 Mexican Revolution. They showcase a unique mix of the cultural influences on the indigenous cultures in Mexico which have now developed into a beautiful dance forms, with its inspiring Mexican music and the rich colorful attire. Here is a look at some facts, about the famous Mexican folk dances. Folk dances in Mexico have traditionally been a way of honoring the Mexican culture and a representation of the struggles and joys of the daily Mexican life. It is a celebration of the religious and cultural rituals and festivals, celebrated by the people of that place. 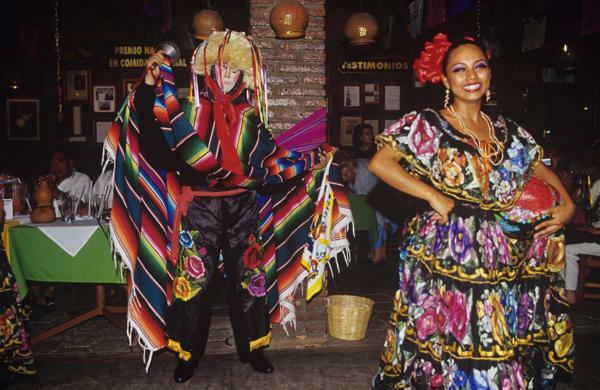 Here are some quick facts about the history of Mexican dancing. The origin of Mexican folk dances lies in the Mesoamerican days, when ritualistic dance was performed to appease the deities by the Mayans and the Aztecs. When the Spanish arrived in the early 16th century, they brought with them, the European-style dances such as the waltz, ballet, polka and schottische, which greatly influenced the indigenous dance form. Subsequent conquests allowed the German, French, Spanish and Italian dances, to mingle with the original folk dance and the emergence of three forms of Mexican folk dance. The first is 'danza', which is an indigenous ritual dance, performed in religious or community settings. The second category of Mexican folk dance forms, is 'mestizo', which showcases the western influences on the indigenous dance, in either the steps or the theme. The 'bailes regionales' or the regional dances, are a manifestation of the dance form by each community. This is usually presented in community and theatrical performances. Each region and state in Mexico, presents the Mexican dance form in a style that reflects its own unique customs and traditions. The characteristics are easily differentiable in the music, the dance and the costumes of the dancers. While some have a more indigenous expression in their folk dance, there are others who draw heavily from the European dance forms, such as the Flamenco. Often considered to be synonymous to Mexican dancing itself, the Jarabe Tapatio or 'the Mexican hat dance' is one of the most beloved dance forms in Mexico. This traditional dance form is considered as the national dance of Mexico. Here are some quick facts about this famous folk dance. Jarabes, derived from the Arab word Xarab means "sweet syrup." Jarabe Tapatio originated in Guadalajara , the capital of Jalisco, and the word Tapatio is a nickname for people from this region. El Jarabe Tapatio is a courting dance, where the man tries to romantically sway a woman into courtship. The woman initially resists the attraction but then gives in at the end of the dance. El Jarabe Tapatio was initially banned by authorities as it was believed to be a defiance against the Spanish rule and was also sexually suggestive. The ban made it popular as a form of protest against the authorities. In El Jarabe Tapatio dance, the women wear the traditional China Poblana, which includes a fringed blouse, a long, bright-colored skirt and a shawl, the men are dressed in an ornate charro or cowboy suit along with big bows and sombreros (A wide brimmed Mexican hat). The dance is usually accompanied with music by Mariachi bands. This dance gained immense popularity when the famous Russian ballerina, Anna Pavlova, incorporated it in her repertoire in 1919. Made to ridicule to the Spanish ruling class, El Baile de Los Viejitos literally translated as Dance of Old Men is an extremely popular and humorous dance form, representing old men dancing with their canes. 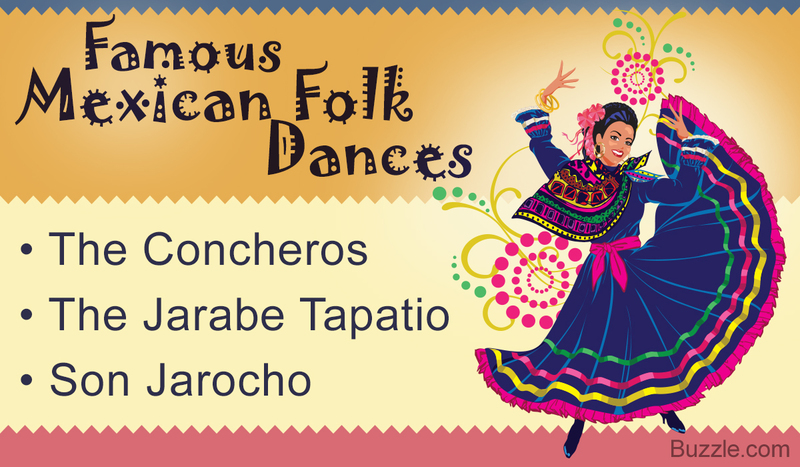 Here are some of the quick facts about this Mexican folk dance. It originated in Michoacan which lies in the South of Mexico. It is essentially a dance of the Purepecha people occupying the lake region of Michoacán. The dance starts off with hunched old men shuffling around in a circle but soon turns into a vigorous dance with a lot of thunderous foot and cane movements. This is accompanied by the men coughing and falling down. The dancers wear traditional clothes which include white pants and shirts which are embroidered at the legs and arms. They also wear masks of old European men with pink faces and white hair and carry canes. The women are dressed in black skirts and multicolored aprons. It is usually danced on the day of festivals like el dia de los Muertos and el de la Candelaria. The Spanish influence on the culture of Mexico is apparent in the Veracruz dance form. An important trading port, Veracruz displays a blend Spanish, indigenous, Cuban and African cultures. This is extremely well demonstrated in the dance form. Originated in Veracruz, a major port city in the gulf of Mexico. Son Jarocho is a courtship dance where the partner tries to tie a ribbon into a bow. The dance is accompanied with exquisite foot stomping and some amazing Son Jarocho music. The dance style which includes huapangos and bambas is influenced greatly by the flamenco steps. 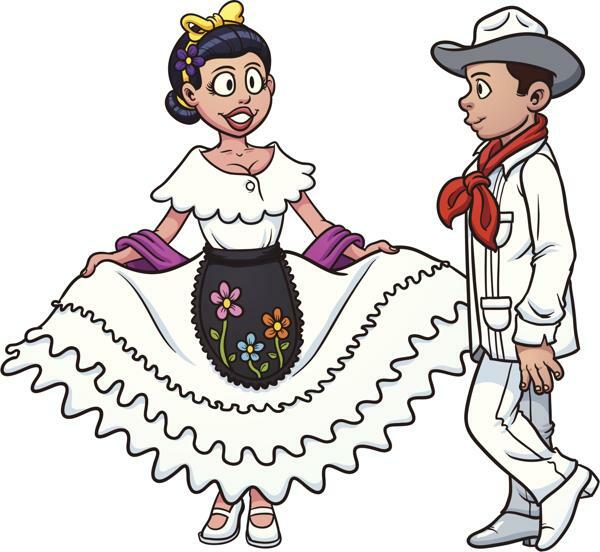 The dance costume for women displays the Cuban and Spanish influences like the flowers on the headpiece, the black apron with embroidery, the lace top and skirts and not to forget the Spanish shoes. The men wear a typical Cuban pant known as "Guayabera." One of the best known Mexican folk dances, the Jaranas is a distinct representation of the culture of Yucatan which is a Mexican port in the Southeast peninsula. The culture, dress and the dance form is influenced by the Spanish and Mayan cultures in this region. The dance originated in Yucatan, Mexico. Like many other Mexican folk dances, this too is a courtship dance. Men and women enter in separate ranks and then break up into couples. There are a number of variations wherein ribbons around a pole are used which is also known as El Baile de las Cintas or the ribbon dance. The costume for the dance is a terno for women. This three piece costume consists of a Mayan tunic called 'hipil', the skirt, called 'fustán' and a embroidered collar called 'jubçn'. The men wear the classic white guayabera and white pants. This dance form which originated in Central Mexico depicts many Aztec symbols and designs. 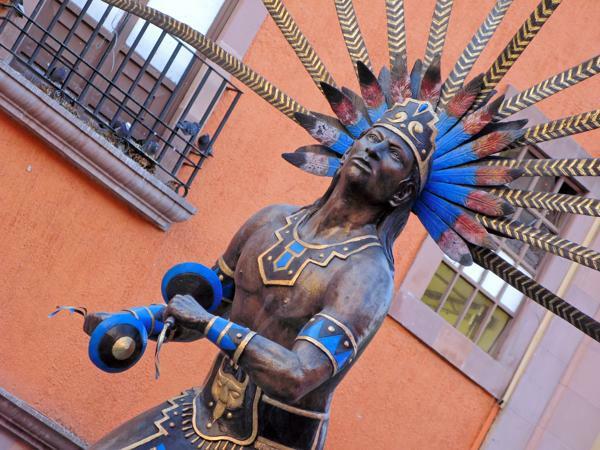 From the elaborate headdress with feathers to Aztec designs painted on the face, the Concheros dance is a beautiful, colorful expression of the ancient Mexican culture. The word Concheros originated from Concha, which is a conch type shell of the armadillo that is used as a musical instrument in the dance. The ritual dance is done as a representation of the pre-Hispanic culture and the dancers. The dancers stand in two concentric circles with the older people in the inner circle while the youth are towards the outside. When the dance starts the two circles move simultaneously. While the movements of the people in inner circle is slow and subdues, the ones in the outer circle dance with energy combining intricate movements with big leaps. The dancers wear colorful headdress made of feathers and cloaks. They paint beautiful Aztec designs on the body as well. 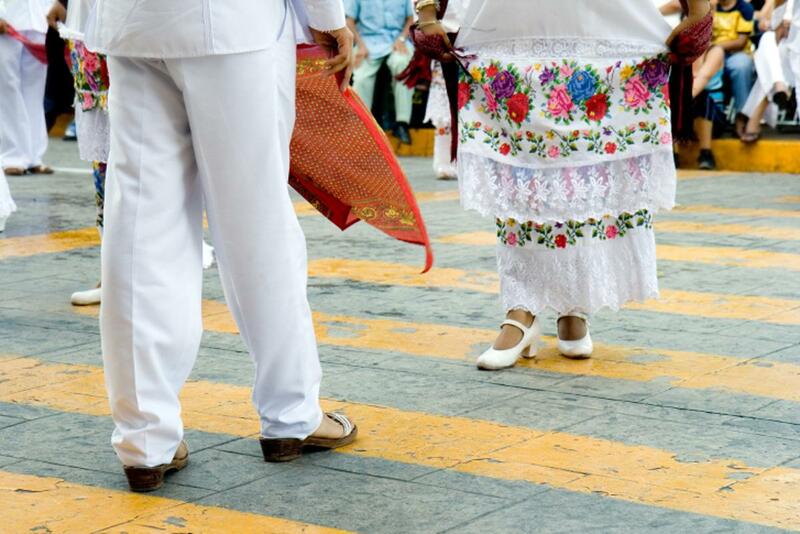 This is a traditional Mexican dance that is done on the Great Feast festival that honors the local patron saints. The festival held in the month of January every year between the 4th and 22nd of the month has lots of ceremonies, music, dancing and local cuisine. The dancers wear wooden masks with light facial features and blue eyes. The fluffy round, light-yellow headdress is one of the characteristic elements of the costume. The dancers also carry striped serapes and colored ribbons over dark trousers and shirts. Parachicos are led by a flute-playing masked patron who carries a guitar and whip, and is often accompanied by two drummers. He sings praises of the patron saints while the rest of the Parachicos respond loudly by clapping and rejoicing. The dance originated in Chiapa de Corzo, Mexico. The dance as well as the dancers are known as Parachicos. The dancers play the chinchines (maracas). The Dance of the Parachicos is marked as the Intangible Cultural Heritage, by UNESCO. La Danza del Venado is a ritualistic dance form performed by the tribe of Yaqui Indians. It is an illustration of a deer hunt, with the dancers wearing wooden masks and impersonating the deer and hunters. Another ancient Mesoamerican dance style is Danza de los Voladores or the Dance of the Flyers. The dance ritual consists of a man sitting on a platform atop a pole playing a flute while the other dancers fasten a rope around the waist and fall backwards to descend to the ground. The dance form originated to appease the angry gods who had brought drought to the land. There are other popular Mexican folk dance forms, like the one which has originated in the Mexican state of Nuevo Leon. Imbibing many of the features of polka dance, it is a loud, lively and intense dance. A beautiful and rather dangerous form of dance, is the 'dance of the machetes', which evolved in Nayarit. Men dressed in white pants, a bandana and a traditional white shirt under a colored shirt, bang their machetes together, sending sparks flying. They form machete arches, under which the women dance. 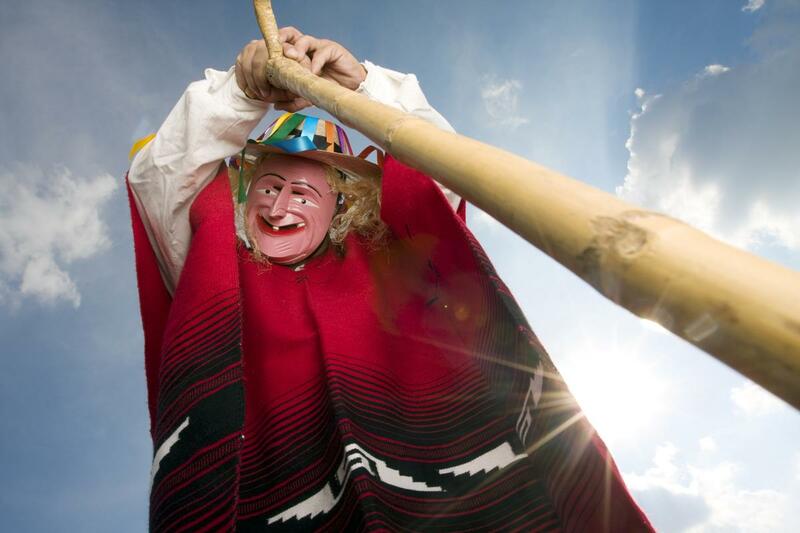 A beautiful carnival dance of the Central Mexico, the Chinelos dance is made to mock the Spanish elite. People wear masks of men with fair skin and long, curled beards along with a huge hat. The dance is more about making fun of the ruling elite instead of showcasing elaborate dance moves. It is also known as the jumping dance as people showcase their innovative jumping and hopping skills. The tropical state of Guerrero which lies along the Pacific coast of Mexico has a range of different dance forms like Chilenos which is done with colorful handkerchiefs. "El Zopilote", "Danza del Tigre" and "El Toro", are dances that have animals as references. Men wear white pants, huaraches and large palm woven hats while the women are dressed in beautiful shift dresses with hair tied in a bun. The Mexican folk dance steps or the zapateado, are dynamic and vary based on the teachings of every individual maestro or teacher.